I don’t know about you, but January is mostly about survival for me. After the fairy-lit fun of Christmas, the rest of winter can seem like a vitamin-d deprived, slightly damp drag. Perhaps it’s a seasonal affective disorder (SAD) thing – I strongly suspect most of us are affected in one way or another by the lack of vital sunlight. Combating the winter blues was something I started to think about back in autumn last year. Citrus and minty smells have been proven to have a very uplifting effect so I stocked up on appropriately zesty shower gels and essential oils so I could kick-start my day on a zingy note and keep our home smelling, well, sunny. I’ve also invested in an SAD lamp – I switch it on each morning while I’m doing a little ashtanga yoga – and it really does help! With a daily dose of positive thinking, vitamin D and the occasional Berocca to give me a little boost in the form of a fizzy shove out of the door in the morning, I feel like I’ve got this season quietly under control. Of course, uplifting scents and adequate vitamin intake is all well and good but it doesn’t change the fact that it’s blimmin’ cold. And full-on winter hasn’t even hit us yet. Remember last year’s Beast From The East?! So what you need is hot soup. Lots and lots of it. 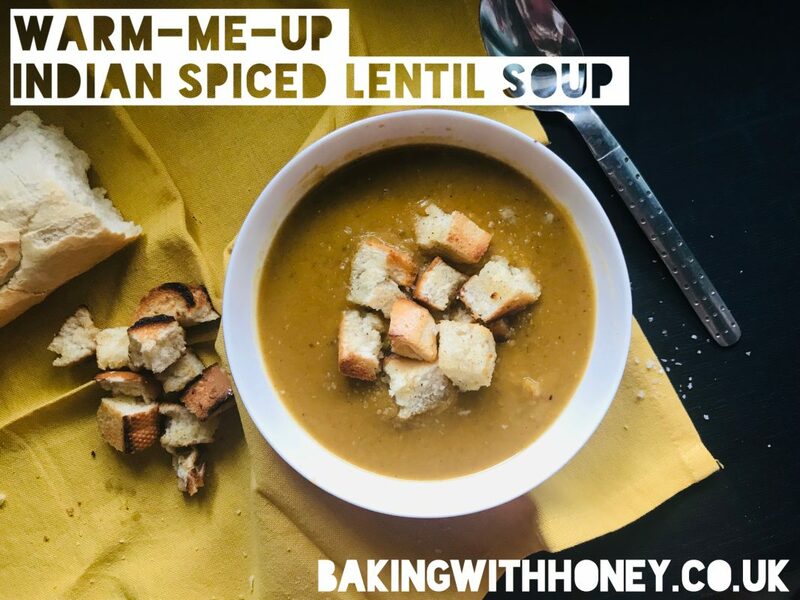 Honey adores soup and she polishes off a bowl of this one quicker than any other; it’s a really nourishing, old-school vegan favourite. It has that satisfyingly earthy, happy hippy feel to it and this flavoursome version is inspired by a curried dahl soup I have enjoyed many times at Govinda’s – a lovely little oasis of calm, providing absolutely delicious vegan food in Swansea. I highly recommend a visit if you’re in the area! 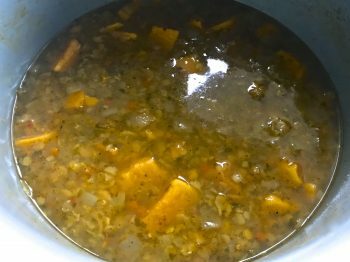 I believe Govinda’s recipe includes a combination of lentils, but for simplicity’s sake I just use good old red lentils (and sometimes half yellow split peas) but you cold use any combination you like – although you may need to increase the cooking time. 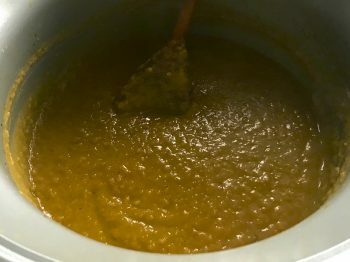 This is a thick dahl (Dal? Daal? Dhal? There’s one for everyone) soup, but easily adjusted if you prefer a slightly thinner consistency. You choose how to blend it – keep a little texture or go for completely smooth. Your soup, your rules! Whatever you do, serve hot with plenty of crusty bread. Want a little crunch? For quick croutons, toast slices of good crusty white bread or baguette, then roughly chop into chunks. Dip the chunks in olive oil and sprinkle with a little sea salt and black pepper. Scatter with wild abandon over your piping hot soup! Makes about four big bowls. Gently fry the onion and celery in the oil until softened then add the sweet potatoes, garlic and ginger and fry for a few more minutes. Sprinkle in the curry powder, garam masala and chilli flakes (if using) and stir until everything is nicely coated. Softly fry for a further minute or two to release all those lovely spicy flavours! Now add the rinsed lentils, hot water and lemon juice and give it a good stir. 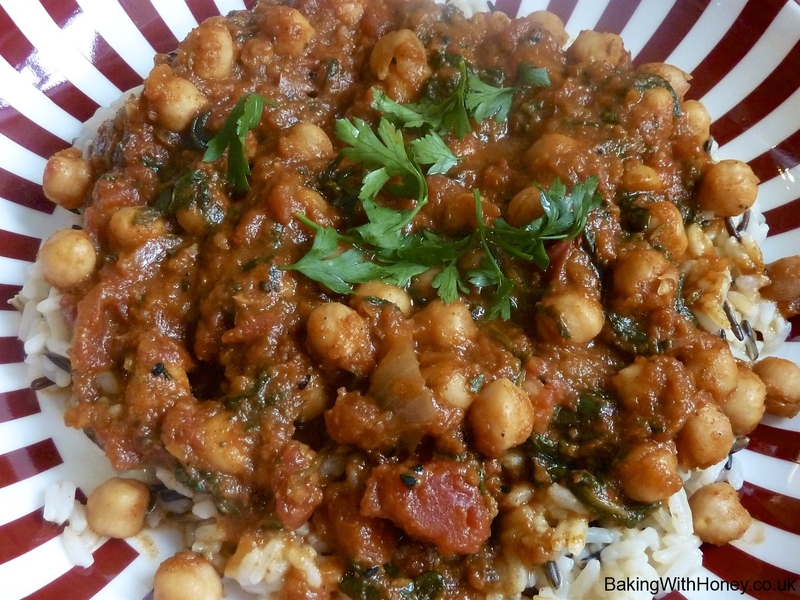 Loosely cover with a lid and simmer for 45-60 minutes, until the lentils and vegetables are soft. If there is clearly a lot of liquid, use a ladle to remove about a cup and set aside. Use a hand blender to blitz the soup to a consistency you like. Add the coriander and a little of the reserved liquid if you want to thin it out a bit.